Toothbrushes are wonderful things. It’s believed that the first toothbrushes originated in Mesopotamia in 3500 BC. Modern toothbrushes as we know them appeared in China from roughly 600 AD and used hog bristles to clean teeth. Ever since then, the design of toothbrushes has changed very little, although the materials have! They’re the absolute foundation upon which good dental health is built. In 2003, toothbrushes were even chosen by Americans as the number one invention they couldn’t live without. You may think that having a toothbrush and using it daily is enough to stave off potential dental issues. Unfortunately, too often, toothbrushes aren’t cared for properly. In dramatic instances, this can lead to the reversal of the benefits of tooth-brushing, and can even cause dental issues. Perhaps the most important aspect of correct toothbrush care is storage. If you store can your toothbrush appropriately, it’s one of the safest bets to avoid bacteria. 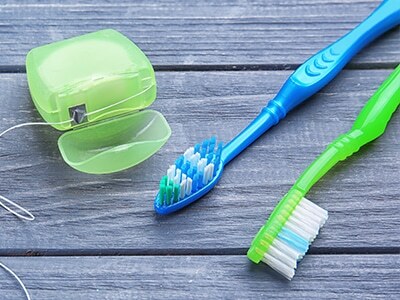 Before considering discarding your toothbrush, and replacing it with a new one; there are a few effective methods to disinfect and clean tour toothbrush, to keep it useful for a while longer. Of course, while these methods may extend the life of your toothbrush, after a time it becomes necessary to replace it. It’s generally recommended that you change your toothbrush every three to four months (or the head, if you use an electric toothbrush). Otherwise, a good way of knowing if it’s time for a replacement is if the bristles are frayed far beyond their initial shape. Don’t share toothbrushes, yes not even with a partner! Appropriate toothbrush care is the backbone of any good dental defence. It will help prevent many of the most prominent dental issues that members of your family could come up against. At dhealth Dentistry, we’re not just reactive – we’re proactive.